Upright stems bear large felty greyish green leaves. Mauve-purple or blue flowers in late spring and early summer, opening from reddish buds. Grows best in moist, reasonably fertile soil in partial shade or full sun if not too dry. Adaptable to most soils and a range of conditions. Can become invasive, though this hybrid does not set viable seed. By root cuttings or division, usually very easy. Woodland and shady wildflower gardens. Herb gardens. The leaves are rich in potassium and can be used as an organic fertiliser. 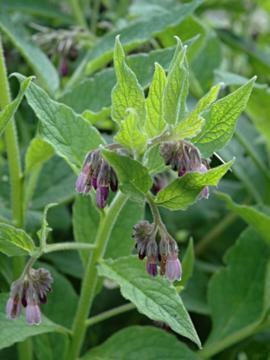 Naturally-occurring hybrid of Symphytum officinale x Symphytum asperum. Naturalised wildflower of wasteground, where escaped from cultivation .